I often freeze a track to render a single clip to audio. As my set grows larger, there are more and more midi clips on a given track. This prolongs my time to render significantly. So much so that I just create an audio track and resample. This is inconvenient. Please make a feature to render a single midi clip to audio. I think you could simply extend the freeze function to a single clip, apply the same colour scheme to denote that the clip is frozen, and there ya go. Siika wrote: I think you could simply extend the freeze function to a single clip, apply the same colour scheme to denote that the clip is frozen, and there ya go. A quick render function like this would let you select a clip and, for example, holding a key modifier drag that selection somewhere else, rendering that selection on the fly when releasing the drag. Another way to do this (one I've been thinking about before, a design that could have nice additional touches added to it) is having a dedicated "quick render slot/zone/holder" neatly in the GUI somewhere. Basically, you could have functions like "render clip into quick holder", "render time selection into quick holder", and so on, in the relevant context menus. If you'd like to "freeze" a certain clip in the arrangement, to be used somewhere else, you could just right click that clip and render it into that quick render slot. Then you would have a visual cue there, that you have material stashed in the holder , and you could drag it from there where ever you'd like. "Render to clipboard" -- another cool thing to have -- would be somewhat similar, but instead of losing that content when copying something else during a routine edit, the holder content would be more persistent. If by "this" you mean what I wrote in that quote, then hmm, no I don't think they do that . If that really is what you mean, you are perhaps confusing the above with some other functionality. If this is true why would you freeze clips if there are no resources saved? What's the gain? Yes, I can read and it works. When I bounced the 2nd clip in place, Bitwig generated audio from the instrument & all nested devices (5 FX), whereas any processing that's outside of it remains intact. So in this particular case, when running the track, FM-4 and 5 nested FX get dynamically replaced by audio sample, so they don't consume CPU cycles and they're turned back on as soon as MIDI shows up. I hear Reaper is even more flexible, being able to freeze at different points in device chain across the track. @antic604, I'm not following. As I understood the suggestion it's about freezing everything in a few clips rather than all clips in a track. While freezing just the instruments would be very welcome I think that's a different suggestion? I assume I missed something, so please clarify. Stromkraft wrote: @antic604, I'm not following. As I understood the suggestion it's about freezing everything in a few clips rather than all clips in a track. Look at my pictures - only half of the track (2nd clip) is frozen/bounced, while the rest is MIDI, which is exactly what OP is asking for. Or not? Nokatus wrote: A quick render function like this would let you select a clip and, for example, holding a key modifier drag that selection somewhere else, rendering that selection on the fly when releasing the drag. BTW, this is also available in Bitwig - I can grab the clip, drag it with a modifier (I think it's Alt, not 100% sure) further down the same track or to a completely different track and the instrument (+nested FX) will bo bounced to audio. 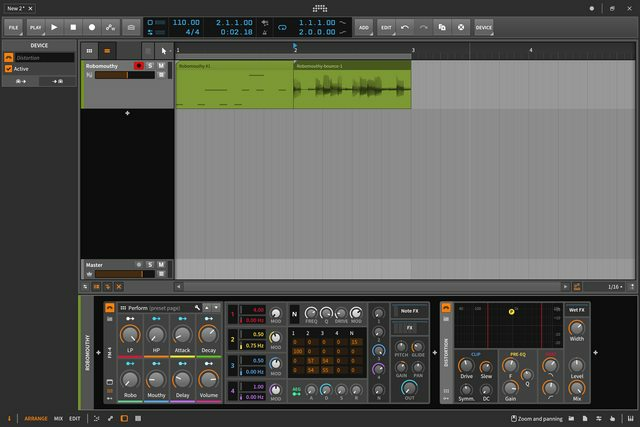 To make it clear - I'm not saying Bitwig is superior in everything because it's not, but there are things I miss a lot when I'm working in Live (I got Push2 recently, so I'm giving it a 2nd chance). antic604 wrote: So in this particular case, when running the track, FM-4 and 5 nested FX get dynamically replaced by audio sample, so they don't consume CPU cycles and they're turned back on as soon as MIDI shows up. Thanks for taking the time to demonstrate that, it really is quite cool and I wasn't aware of this functionality . I'm left wondering if it's indeed possible to switch devices on the fly like that in Reaper as well -- that's the one I have quite a bit of experience with, and I haven't bumped into a feature like this. There are some things that still make it problematic, though, as I was thinking of cases where the effects following the instrument (or the instrument itself) produce a tail/release beyond the MIDI clip boundaries. So if you have multiple subsequent clips of MIDI data, side by side, and you want to freeze just one in the middle, on the fly, the freeze function needs to account for the tail section that doesn't actually overlap the timespan of the actual clip. This can be solved elegantly though, and probably already is. I agree it's very cool. I'm using the word "problematic" in the sense of "non-trivial." As in, it poses actual problem cases to solve, and can also be challenging depending on the underlying architecture, so that it's not merely a straightforward incremental change to an existing feature (for example, in Live one track cannot host both MIDI and audio data, and starting to solve for a freeze function that activates and deactivates devices on the fly also needs a different underlying track/routing design to begin with). Naturally I'm not implying that it's at all impossible . If something's impossible, as in requests that would need DSP that has data from the future (that does happen), haha, then that's the appropriate word. antic604 wrote: BTW, this is also available in Bitwig - I can grab the clip, drag it with a modifier (I think it's Alt, not 100% sure) further down the same track or to a completely different track and the instrument (+nested FX) will bo bounced to audio. 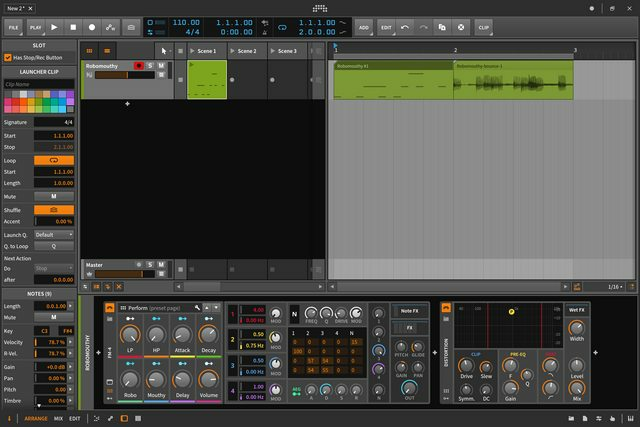 Bitwig is hugely flexible in that regard, for example you can select time on group, send or master track and bounce-in-place which will give you the sample of sound being generated there. It's much faster than resampling in Live. Obviously this is the result of designing it with hybrid tracks in mind, so a track is just a container for clips, that can be MIDI or audio and setting the priorities, eg. if there's audio it has a priority over any sound coming in. Nokatus wrote: If something's impossible, as in requests that would need DSP that has data from the future (that does happen), haha, then that's the appropriate word. Yes, but that was just a typical use case. You can for example send the sound to Reverb, but then use Time Shift to delay the actual sound source so you're reverb will sound before the signal it responds to. 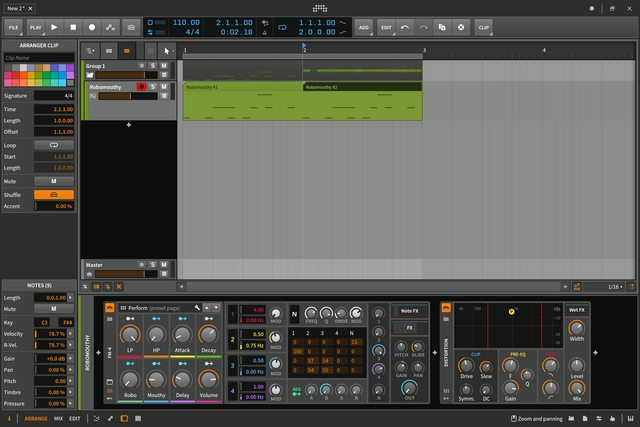 It's just an example of Bitwig's out-of-the-box thinking, because many DAWs will have delay compensation setting per track (to align one track with the rest), but Bitwig takes it a step further, by allowing you to do that within the devices' chain.